When I said in an earlier post that our passes are working double-duty this year, I really meant it. This weekend we skied Saturday at Gore and Sunday up at Whiteface. After a week-long thaw, I would have been just as happy to stay home and tune a few pairs of skis, but we awoke Saturday morning to a coating of white on the lawn and the kids twisted my arm to head up to the mountain for at least a few runs. I almost feel guilty. It's been a rocky start to the ski season, but I've managed to log 4 out of 4 excellent early season ski days. Part of it is luck. We've skied on days when the sun is out and the snow is soft. Part of it is a function of low expectations, like our trip back up to Whiteface on Saturday. Skies were gray, temperatures 40-something, and there was no sign of winter anywhere. Enthusiasm was in short supply as we pulled into the lot looking up at a mountain brown clear to the summit. 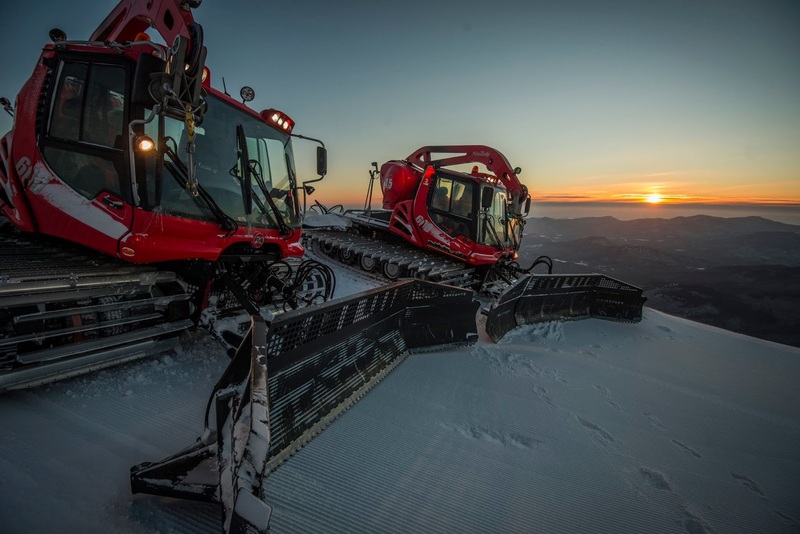 In a way, Whiteface’s marketing department couldn’t have picked a better day to showcase the mountain for its annual Media Day event on Wednesday. Even though the ground was as bare and brown as my own backyard, the open trails were covered top to bottom and edge to edge with snow. The difficult start to the ski season is a reminder that without snowmaking, right now there’d be no skiing at all anywhere in the northeast. Despite the unseasonably warm weather that has played havoc with early season ski conditions throughout the northeast, we've managed to pull out two decent weekends of skiing in a row to kick off our season, up at Whiteface last weekend and now at Gore. We were surprised to see the guns still blowing on the upper mountain as we pulled into Gore's parking lot Saturday morning. Temps were marginal for snowmaking, but crews are taking advantage of every opportunity to lay down a base and expand available terrain. Felt like spring pulling into the parking lot. Cold, please? If I heard one more of my neighbors or co-workers remark about the "lovely" mild November I might have popped him one, but finally the just-barely-cold-enough nights allowed snowmaking crews to get Gore and Whiteface ready for the traditional Thanksgiving weekend season opener. With temperatures soaring to near 60 degrees down here in the flatlands on Friday, we figured the best skiing on Saturday would be further north than Gore, so we headed to Whiteface to kick off our season. 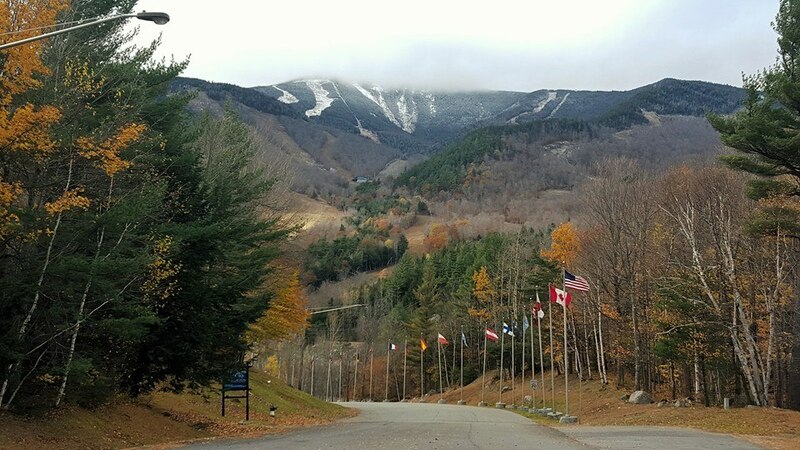 It may seem like fall is reluctant to give up its grip on the northeast, but ski season is just around the corner. Gore and Whiteface are targeting the day after Thanksgiving to start spinning their lifts, with most other New York ski areas following suit shortly thereafter. It was supposed to be Whiteface. I should have been arriving at the top of Whiteface right around the time I was leaving Noonmark’s summit and heading over to Round Mountain. But the Whiteface Mountain Uphill Foot Race was cancelled, leaving my Saturday morning open. I already had the date reserved on our family calendar (a significant effort), so the last thing I was going to do was waste the day on yard work. For 7 out of the last 8 years we've taken a week's vacation at the same part of Outer Cape Cod (Truro), and it seems we keep searching for the perfect rental house with the right combination of price, availability and location, location, location. Maybe this year's house, steps from a quiet bay beach, Fisher Beach, is the one. At the foot of this cliff a great ocean beach runs north and south unbroken, mile lengthening into mile. Solitary and elemental, unsullied and remote, visited and possessed by the outer sea, these sands might be the end or the beginning of a world. The landscape surrounding this year's house, just a few miles away, is entirely different. Rolling hills overlook a comparatively calm Cape Cod Bay. Sometimes wooded, sometimes open, this is the landscape of Edward Hopper, the iconic American landscape artist who summered at Fisher Beach for 40 years. While reading Beston's The Outermost House, I got inspired to put together a mountain bike ride that would connect the two landscapes, staying entirely off pavement. A bay-to-beach-and-back ride. It seems like the junior spelunkers in our family have been asking me all summer long "When are we going back to Eagle Cave?" We had explored the entrance and upper reaches of the cave on a trip back in mid-June, but had turned around when we reached a point where a rope would be necessary to explore further. This time we came prepared. In a textbook example of environmental groups, local government and citizens working together, the Lake George Land Conservancy just last month closed on its purchase of the prominent peak outside Bolton Landing known as The Pinnacle. The closing was the culmination of more than 5 years of negotiations to protect the parcel. A trail has been marked and is now open to the public leading to the spectacular summit overlooking Lake George. We hiked the new trail this past Saturday. The trail can best be described in one word: easy. That's not to say that you don't have to work for the view, but it's as easy as 400 vertical feet and a mile each way can be. I'm seriously considering bringing my parents up, and they're in their upper 70s (now I'll find out if they really read my blog). The route follows a jeep trail that would have been the driveway leading to 3 homesites on the ridgetop, climbing rather steeply at times but with good footing and a steady grade. Compared to the rough jeep road up Thomas Mountain (another nearby LGLC site), the Pinnacle trail is much easier. Before I was a hiker or a skier or a climber, I was a paddler. Granted, the term “paddler” may be overselling things a bit, but nonetheless my first introduction to the Adirondacks came as a kid at Scout camp, where paddling the lakes and ponds near Upper Saranac Lake on mulit-day canoe trips was an integral part of the program. I paddled those waters for 5 years as a camper, 5 more years on the camp staff, and have returned many times as an adult. In a way, those waters represent my Adirondack roots. Luck was again on our side last weekend up at Chapel Pond, this time at the Beer Walls. Threatening clouds loomed over the mountains at times, but the day stayed dry and other climbing parties for the most part stayed home. With a murky start to the day in Saratoga, we took a gamble on the weather and headed up to Chapel Pond. I guess luck was on our side because the clouds broke just as we pulled off Exit 30 of the Northway. I keep a mental short list of 4 or 5 crags in the Chapel Pond / Keene Valley area that are suitable for a family climbing session, and seeing no cars parked for the Gems & Jewels crag as we drove by, I hung a quick U-turn and pulled in. Family plans kept us close to home last weekend, but we managed to squeeze in a quick half-day hike at Moreau Lake State Park. 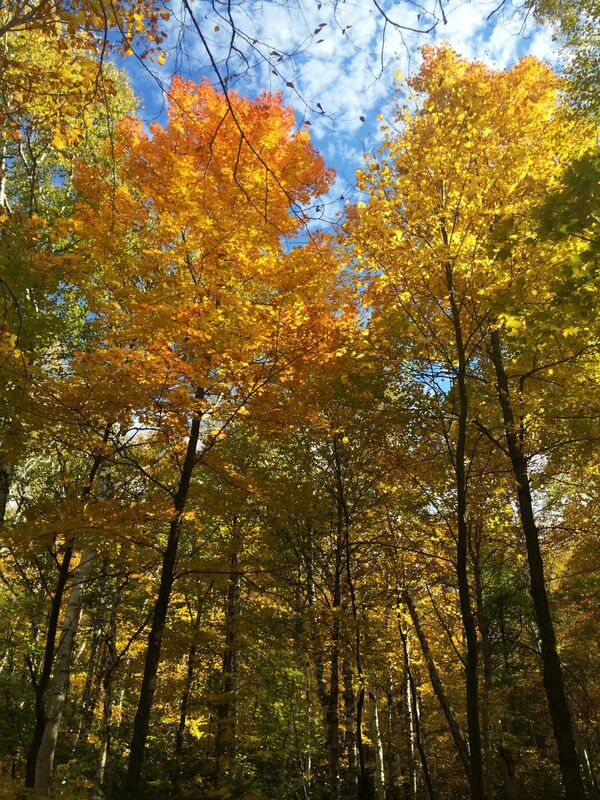 Visitors come in throngs for the park's beach and campground, but many are unaware of the park’s wild side – nearly 5000 acres of rugged forest on both sides of a scenic stretch of the Hudson River. With a 3-day holiday weekend, we knew the popular trails in the Adirondacks would be crowded. Indeed, the Giant Mountain, Roaring Brook Falls and AMR trailheads were packed as we pulled in to the Mossy Cascade pullout along Rt. 73 in Keene Valley. Three or four other vehicles were already parked there, a relatively busy day for this lightly traveled trail that leads to one of the best views in the High Peaks. Weather forecasters had been predicting a washout weekend for days, but as the details solidified it appeared we'd have a reliable window of clear and dry weather for at least the first half of Saturday. Looking to beat out the approaching storm, the kids and I got an early start and headed due north to hike Pok-o-Moonshine Mountain, the prominent peak visible from the Northway between exits 32 and 33. The weekend weather was again ideal for hiking, and we headed up to Goodnow Mountain, the small but popular peak just outside of Newcomb. Frequently cited for having one of the best views for the effort – and I know I’m losing credibility since I’ve said that about so many of the Adirondacks’ lesser peaks – Goodnow really delivers some eye popping views, as long as you’re willing to climb the 60’ fire tower. With brilliant blue skies, crisp morning temperatures and the bright green foliage of early summer, this weekend brought hiking conditions that easily rivaled the best days of fall. I get why hikers rave about fall, but I’d rather have the longer days, wildflowers and the promise of an entire season ahead. Our family hike Sunday took us to Chimney Mountain. Despite its relatively low summit elevation (2700’), Chimney boasts a spectacular panoramic view of the central Adirondacks. But what really makes Chimney Mountain unique in the Adirondacks is its fascinating geology. The Lake George Land Conservancy's Cat and Thomas Mountains Preserve has long been one of my favorite hiking destinations for its convenience (5 minutes from Bolton Landing) as well as the excellent views of Lake George and the southern Adirondacks from its summits. Over the years it seemed I was neglecting Cat - the shorter distance up Thomas (a 4 mile round-trip versus 7 up Cat) more often than not trumped Cat's superior views. But a new route, recently marked by the LGLC, now offers a direct approach to Cat's summit. I intentionally held off writing my season wrap-up for a couple weeks, holding out hope that I’d find some way to squeeze in one more day. Killington is still open and there’s always Tuckerman Ravine, but the reality for me is the fat lady has sung. No regrets though. Our ski season spanned six calendar months, from mid-November into April. We had powder days, spring days, cross-country skiing, lots of tree skiing, the slides at Whiteface and our first family trip out west. I’ve said it before and I’ll say it again: when conditions are good at Whiteface, it’s a serious contender for King of the East. And conditions at Whiteface weren’t merely good on Sunday, they were phenomenal. I’ve already had a good run of spring skiing this year, starting with a taste of spring on Hickory’s closing day at the end of March and continuing with Sugarbush and Gore the following weekend. But Sunday at Whiteface topped them all, with perfect spring weather and snow. As the saying goes, you don’t know if you don’t go. We had expected to find overcast skies and re-frozen snow conditions, but instead found sunny skies and surprisingly soft spring snow, despite chilly air temperatures. I guess we've now made a family tradition out of heading up to Sugarbush for a day of late season skiing. Last year we skied on Daniel's 10th birthday in early March, this year we pegged the Good Friday holiday to use our free lift ticket vouchers from the local screening of Warren Miller's No Turning Back. As Friday approached, we fretted over the changing forecast (showers, clouds, sun, all of the above), but we pulled into the parking lot with bright blue skies and temperatures that screamed "Spring's here!" Hickory’s motto “Ski the Legend” tells you just about everything you need to know about Hickory. I’ve been waiting for the right time to share the legend with our kids, ages 7 and 11, and took advantage of last Sunday’s early spring conditions to do just that. As one of the few remaining ski areas in the northeast that relies solely on natural snow, you’ve got to time your visits to Hickory carefully. But this winter’s been kind to Hickory – consistent cold temperatures allowed Hickory to remain open just about every weekend since mid-January. We visited on Hickory’s final day of operation for the 2014-15 season, and coverage was still excellent. I can understand how some people may be getting weary of winter. Here it is almost April, and we’re struggling to get out of the 30s most days. And that’s in Saratoga. In the mountains, winter hasn’t even started to think about loosening its grip. After last weekend’s uninspiring conditions we felt the need for a change of pace, so we headed up to Whiteface on Saturday. Whiteface can be a tough mountain, but somehow we always seem to luck into good conditions up there. Perhaps it's just an indicator of how spoiled we've been by this winter's reliably good ski conditions, but if there was a weekend to stay home, this was it. We were in fact going to do just that, but some sort of mild panic set in Sunday morning as we confronted the reality of a winter weekend without skiing. That's right, winter! It's still winter! And skiing is what we do in the winter! A quick update from Saturday at Gore. The weekend may have featured winter's last full grip on the mountain, as spring conditions have taken hold since then. Despite a lack of recent snowfall, the mountain skied well with generally edgeable hardpack conditions on the steeper expert trails and packed powder on the lower mountain cruisers.